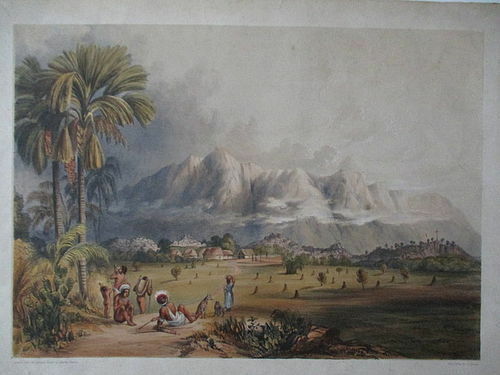 One of 12 lithographs published by Ackermann London, in 1840/41 as part of a portfolio, “12 Views in the Interior of Guiana.” The original sketches were made by John Morrison who accompanied Sir Robert Hermann Schomburgk on the exploration into what would become British Guiana. The sketches were developed by Charles Bentley into the drawings that were the basis for the lithographs. Printed in black with hand coloring. 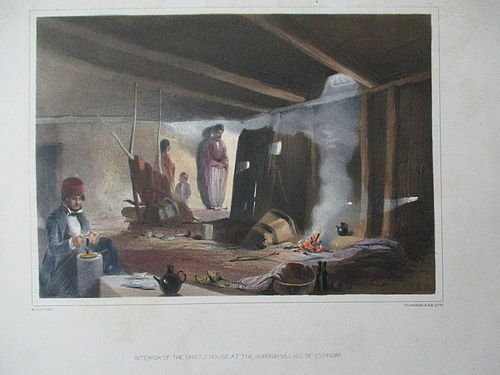 A hand colored lithograph of the interior of a dark house with a fire and a man lighting a candle with the title, “INTERIOR OF THE CHIEF’HOUSE AT THE KURDISH VILLAGE OF ESPINDAR.” In the lower left under the border is printed, “R.CLIVE, DEL.” and lower right DICKINSON AND CO LITH.” Image with border 7 ¼ inches (18 cm) tall and 10 inches (25.5 cm) wide. With title 8 ½ inches (21.5 cm) tall. Sheet 16 3/8 inches (41.5 cm) by 22 5/8 inches (56 cm). An albumen photograph of the upper portion of the Taj Mahal in Agra, India fully laid down on cardboard stock. The blind stamp, “FRITH’S/SERIES” is in the lower left corner. The image is 6 3/8 (16 cm) by 8 ¼ (21 cm) inches. The card is 10 (25.5 cm) by 12 (30.5 cm) inches. 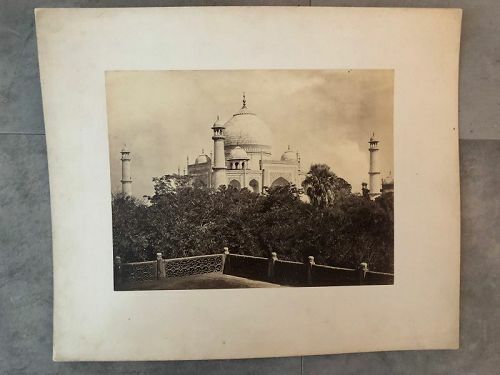 In pencil on the back in the lower left is written, “3067 The Taj Agra India.” Francis Frith commissioned and bought from other photographers for his series. 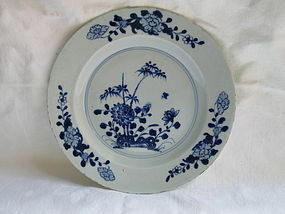 A lobed dinner plate 9 ½ inches (24 cm) diameter decorated with a sprig of cornflowers (?) in the center of the well surrounded with numerous single red or gilt flowers. The lip is decorated with richly gilt and enamel swags surrounding floral cartouches. The rubbed overglaze “VV” on the back is the mark for the Verneuilh factory. 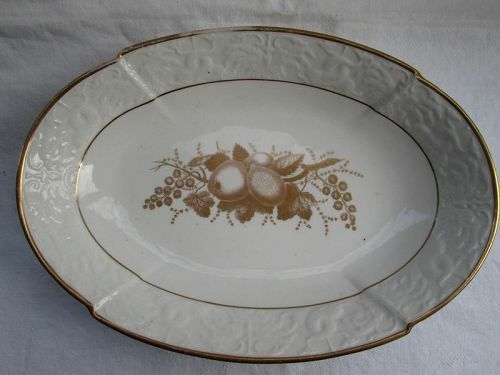 It dates from the 1780’s; possibly 1787 when Vanier entered a contract with the Verneuilhs. 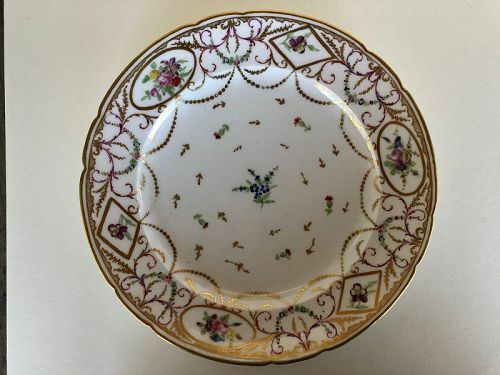 A lobed dinner plate with dentil gilt rim, the lip with a garland of flowers and leaves twined around a thick gold band and the center of the well with a large spray of roses surrounded by smaller sprays of flowers. Diameter 9 ½ inches (24 cm). 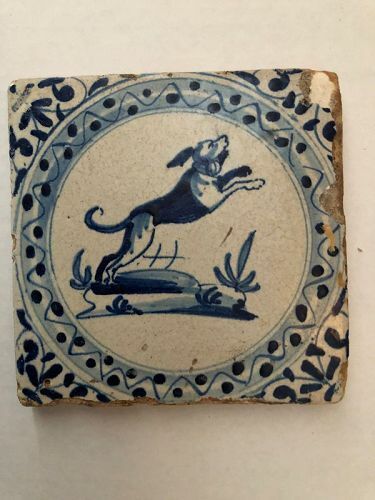 The mark in underglaze blue on the back is the crossed torches of Locre, sometimes called La Courtille. The factory was active from 1773 to 1824. 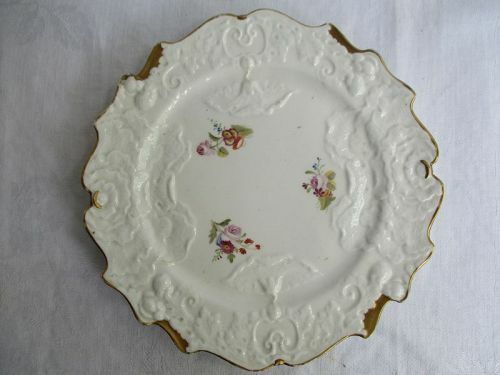 Stylistically this plate is from the late 18th century. 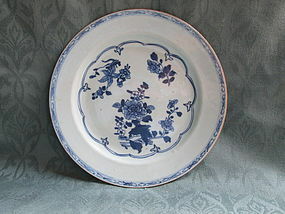 A Chinese hand painted blue and white porcelain deep dish with a wide rim and a brown outside edge. 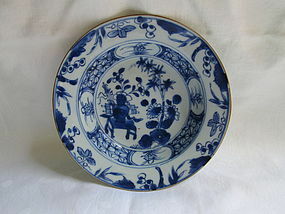 The underglaze blue decoration on the inside is flowers and a table with a vase of flowers. On the outside are a couple of loosely painted floral designs. Height 1 ½ inches (4 cm) and 6 3/8 inches (16 cm) diameter. Condition: No cracks, hairlines or repairs. One small chip on the rim. There are a few firing flaws and some use scratches in the bottom of the bowl. A Chinese export blue & white plate mid-18th c.
A Chinese export blue & white plate mid-18th c. A nicely painted underglaze blue Chinese export porcelain plate from the mid-18th century decorated with flowering plants and bamboo in the center and three similar sprays of flowers around the edge. Diameter 9 inches (22.5 cm). 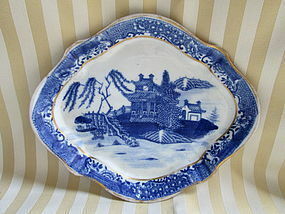 A underglaze blue hand painted blue and white export plate depicting three sprigs of flowers enclosed in a lobed border with fleur- de-lis and on the outer border a loosely painted fence. The outer edge is painted brown. 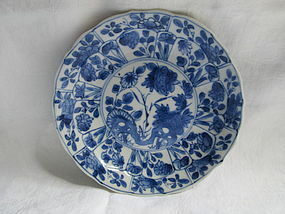 Given the vague Western references in the decoration the plate is probably after 1750. 8 7/8th inches (22.5 cm) diameter. Condition: No chips, cracks, hairlines or repairs. Very minor stacking wear. Minor firing flaws. 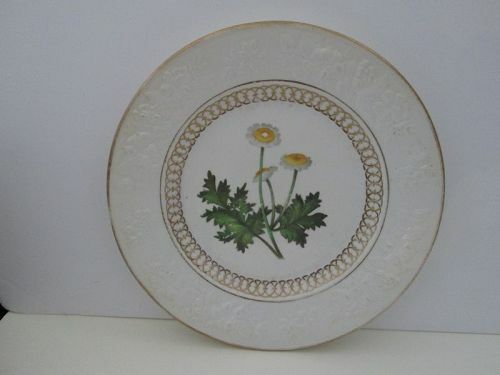 A porcelain plate with a gilt edge, embossed border, the molded edge of the well decorated with elaborate gilding centering on a hand painted botanical specimen of a Feverfew; a member of the daisy family. The plant name is written in script in red enamel and the number “857” in gilt are written on the back. 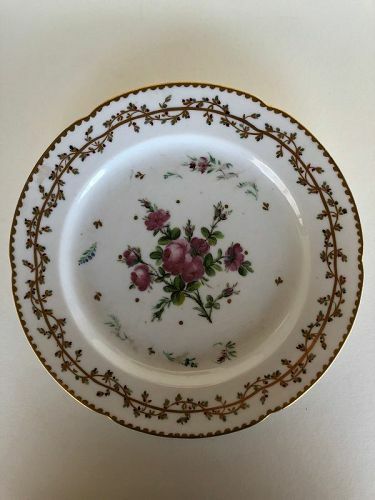 The combination of the embossed border, the botanical sample and the heavy porcelain all indicate that the plate was made and decorated at Spode. 8 7/8 inches diameter. 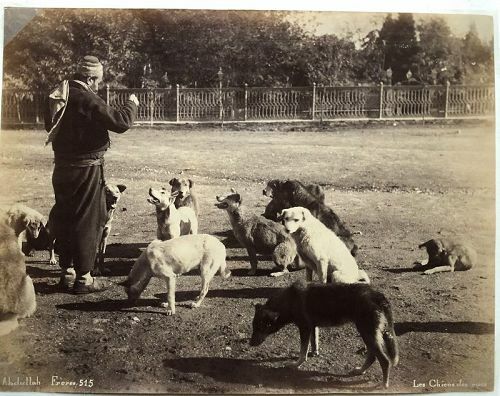 An albumen photograph circa 1880 of a man feeding a group of dogs gathered at his feet. In the lower left printed in the negative, Abdullah Freres. 515” and in the lower right, “Les Chiens des rues.” The image is 7 7/8 inches (20 cm) by 10 1/8 inches (25.7 cm). 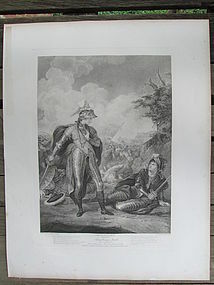 It is presently corner mounted in a large mat 17 inches (43 cm) by 14 inches (35.5 cm). The tones are rich and the contrast good. 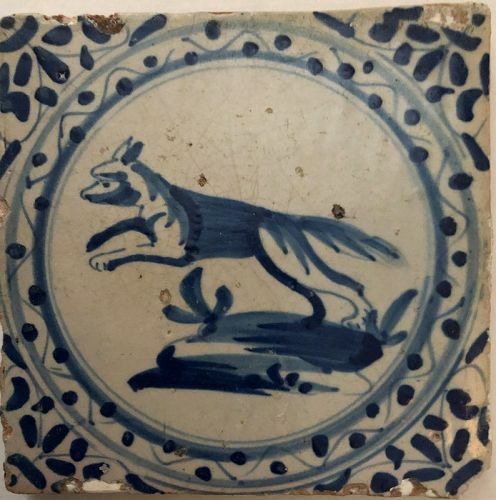 A hand painted blue and white tile of a wolf, at least that is what it looks like though the head is a little odd, in profile running to the left. The animal is surrounded by a circle of a wavy line with dots in the wave troughs. Flowers fill the corners. It is 5 1/8 inches (13 cm) square about ½ inch (1.2 cm) tall. The red clay sides are beveled so that the back is slightly smaller than the front. This style of decoration was used in the 2nd quarter of the 17th century.